Online Andorra chat sites is very hard to find on Internet because there are not many Andorrans living in the earth. Andorra is a little country with a small population. So it will be hard for you to find an online Andorran on Internet. We recommend you to look for an Andorran partner from Omegle or Facebook. So it won’t be problem for you to find a suitable one for yourself. You can also send offline messages if your potential partner allowed it on Facebook. All the same we will recommend you some Online Andorra Chat sites for you. I hope it will be useful for you. People are speaking Catalan language in the country and you will able to find Catalan Chat on websites which we will recommend you on here. There are only a few websites which we can recommend you for talking to people. You should be careful about timing. There are only a few people who are joining this small social networking platforms in the country. You need to have luck and good timing to meet them. AndorraMania has an ordinary and basic chat room in their site. It’s easy to use and chatboard is in English language. However people are generally speaking Catalan language in site and you may find people who are speaking English. A good Catalan chat site. There’s no private messaging or webcam or microphone features in site. I should admit that this website is generally empty as same as other Andorran websites. It will be hard to see someone online in this site. All the same you can leave a message here that you are looking for a partner. 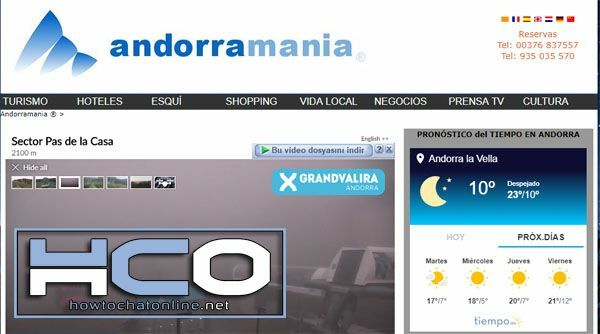 AndorraMania is the only local chat website of the country. There are also information on tourism, hotels, shopping, news on the country. You can view the website in different languages of the world. Andorra Mania and IRC2Go are the best options for chatting with people from this country but it will be hard for you to find someone online there. If you are looking for a Catalan social networking, these sites will give you what you want. Update (03.04.2018): We couldn’t find any chat room for the website at the moment. Yes, unfortunately there are not too much options for this country at the moment. We have already mentioned about other social networking platforms like Facebook and Twitter. You can take a look at our other tips about the country and you can get some good results. We are going to mention about more about this at incoming pages of our website. Thank you for the feedback Bianca.